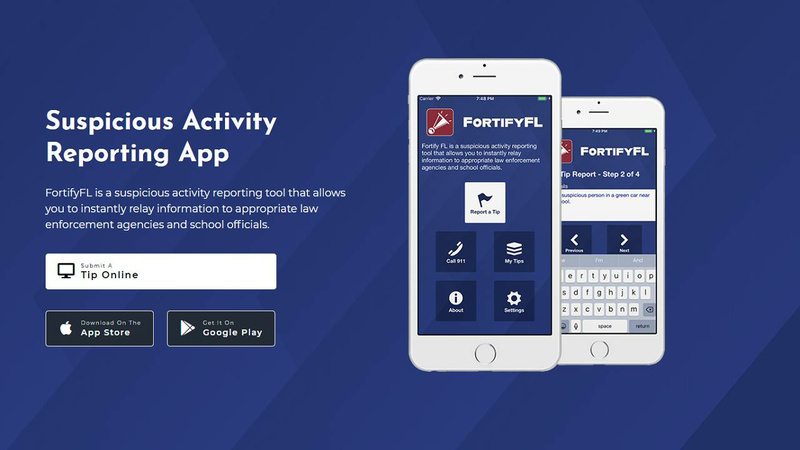 ORLANDO, Fla. - The Fortify Florida app, an anonymous reporting tool, was designed to keep Florida students safe by allowing them to report anyone threatening violence. The app is free for anyone to download on the Apple App Store and Google Play. After downloading the Fortify Florida app, the user is prompted to answer whether they'd like to a "report a tip." The next step is to determine whether or not the issue is an emergency. The application provides a a "yes" or "no" option for this. If "yes" is selected, the user is given a link to immediately call 911. If "no" is selected, the user is asked to search for a specific school. After selecting the correct school, the user is prompted to type the details of the threat, and then to click "next." After that, the app provides an option to upload any files or pictures, such as a screenshots, to law enforcement officers. Lastly, the user is given an option to provide their name, phone number and email address. However, tips submitted through Fortify Florida can also remain anonymous. If you would like to submit a tip without downloading the application, you can submit information through the website by clicking here.